How different would it feel to treat your skin to natural skincare products, every single day? I’m talking indulgent skin foods like, Strawberry Ginger Scrubs, Coconut Milk Cleansers and Herbal Bath Tea… you would absolutely GLOW!! Everyone should be able to have this kind of skincare. Products that are luxurious, safe and effective, without harsh chemicals and weird ingredients that don’t do a body good. Want to kick bad skincare to the curb? I’m with you! 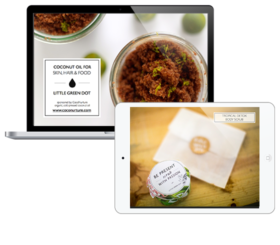 My whole thing is showing you how to get self-made, natural skincare into your own hands. Spend time around here and soon you’ll start looking at the produce aisle in your supermarket like it’s the beauty counter at Neiman Marcus. I call it whole food skincare. It’s about using real food ingredients to nourish the healthiest, happiest skin ever. And here you’ll find all the recipes you need to care for your skin’s basic needs, with gentle ingredients and a minimal skincare routine. When you make your own skin care, it’s stripped of the labels, the high end price tags, the harsh chemicals and negative beauty messaging. With something that you made yourself – you can finally enjoy skincare that does what it should do: nourish healthy skin, boost your confidence and bring out a glow like no other. And it can be simple. I’m here to show you how to make safe and effective skin care for yourself and your family. It’s like the best kind of food, but for your skin. It makes you feel good, it makes you look amazing and it’s a pure joy to use! Whole food skincare is for everyone. It’s full of nutrients, minerals, vitamins – everything a body needs to thrive (and none of the junk it doesn’t!) The same foods that you eat to be healthy inside, will take care of your body from the outside too: You can cleanse, tone, moisturise, heal, soothe and create glowing skin. I’ve taught hundreds of people in my in-person workshops and online skincare courses how to create safe, effective skincare at home. Want to give it a whirl? Try one of my all-time favorite skincare recipes and get started in just 5 minutes! It creates opportunity for self care. We can make excuses all day long when it comes to taking care of our own needs… but self care matters. It changes the way you feel, it gives you a chance to check in with yourself, replenish and avoid burnout. It can be as simple as a handmade scrub in the shower or a fragrant body oil that makes you feel good. Save the planet. We are living in a time of consumerism and creating a mindset of “buy less, make more” creates a positive impact on this world. Living in line with your values is beautiful! Feel good knowing that your choices promote a healthy, sustainable world. Health is beauty. Whole foods are rich in minerals, vitamins and nutrients – everything good that the body needs! Our skin can absorb more than 60% of what goes on it – feed it nourishment and you’ll see, your skin will thrive. It’s good for your wallet. Research shows that more people than ever want to buy organic and natural products, but the high-costs can make us compromise on those choices. When you make your own skincare, you don’t need to compromise! You can enjoy natural, absolutely luxurious, high quality skincare. It just works! When you simplify, remove the excess and give your skin a break from all the harsh chemicals, it has a chance to rebalance and thrive. Whole food skincare creates healthy, glowing skin. Whole food skincare is not just a weekend craft, it’s a lifestyle and it works! Don’t try everything at once. Start with one recipe, that you feel most excited about. Do you want to try a scrub or body butter, maybe a bath soak sounds good? Or think about what your needs are: are you looking for a gentler cleanser, maybe a good moisturiser? Look through the recipes, pick one, take time to learn it and make it yours. Seal it tight. Natural skincare doesn’t have preservatives, so we need to package it into clean containers that keep light, air and/or water out of your product. The majority of my recipes are self preserving, or if they’re made fresh are designed for single use. Don’t forget to label it! This always happens – you’ll make it… and then forget what it is! Make sure to label your product and put the date on it. Listen to your skin. We’re all different, what works for one person may not be right for you. If you have allergies to an ingredient, don’t use it! The good news is that because we’re using minimal ingredients – if you do have a response (like redness, or itching) you can easily discover which ingredient might be causing it. It’s always a good idea to do a patch test when trying something new. Don’t overcomplicate it! You don’t need to source exotic skincare ingredients, like Chaulmoogra Oil (what aisle is that in?) Keep it simple and use what’s around you. Your local health food store, supermarket and farmer’s market is a treasure trove of skincare ingredients! I hope you’re getting as excited about whole food skincare as I am. To get started, why not try one of my all-time favorite skincare recipes – you could have your first natural skincare product in just 5 minutes!